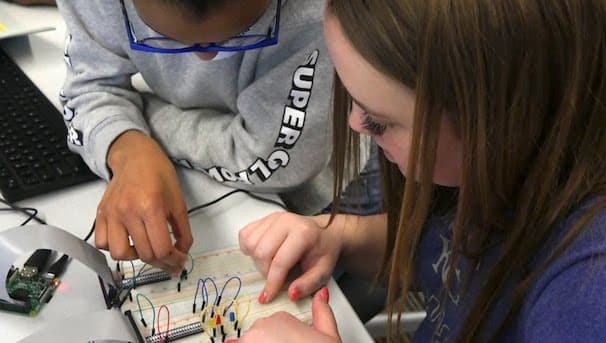 As part of a capstone project, two seniors from the KU School of Engineering are putting together a STEM-focused conference for middle school girls and their mothers. This conference will take place on Saturday, February 17, 2018 at the School of Engineering. Fifty participants will be invited to attend the conference free of charge. Participants will be chosen through an application process overseen by representatives of the KU School of Engineering student organization SPARK. The day will be filled with guest speakers from industry and the community, STEM activities to engage both mothers and daughters, and breakout sessions that will cover a variety of STEM-related topics. The theme for this conference is to “Make it Happen” as the goal is to empower attendees to realize that they can use STEM to make changes with their own lives and their community. We are very excited about the conference, but need your support to ensure that it will be a success. Make a gift today to support SPARK and future women in STEM fields! Your donation will provide food, t-shirts and interactive activities for conference attendees, and will continue to promote learning in all areas of campus. All donors who choose to list their name publicly on the donor wall will be recognized at their respective sponsorship level in the conference booklet, on the website, and on all other promotional material. For more information, please visit our website at www.makeithappenku.com. This project is sponsored by Student Endowment Board. To learn more about SEB, click here. Your gift will provide lunch at the conference for one girl, so we can keep her mind nourished and engaged. Your gift will provide lunch and a t-shirt at the conference for one girl. Your gift will provide one participant with supplies for an awesome interactive activity. Your gift will support a participant for the entire day including lunch, activity supplies, and a t-shirt. Your gift will support a participant, her mother, and a volunteer for the entire conference. Your gift will make conference attendance possible for five girls. Donors at this level who choose to list their name publicly on the donor wall will also be recognized as an Empowerer Sponsor at the conference and on conference t-shirts.